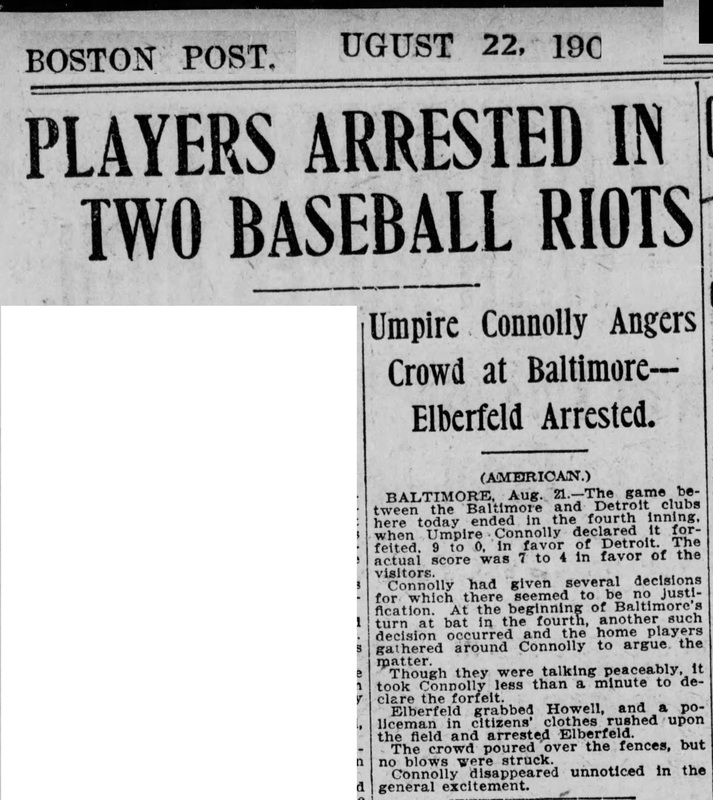 Umpire Connolly Angers Crowd at Baltimore-- Elberfeld Arrested. BALTIMORE, Aug. 21.—The game between the Baltimore and Detroit clubs here today ended in the fourth inning, when Umpire Connolly declared it forfeited. 9 to 0, in favor of Detroit. The actual score was 7 to 4 in favor of the visitors. Connolly had given several decisions for which there seemed to be no justification. At the beginning of Baltimore's turn at bat in the fourth, another such decision occurred and the home players gathered around Connolly to argue the matter. Though they were talking peaceably, it took Connolly less than a minute to declare the forfeit. Elberfeld grabbed Howell, and a policeman in citizens' clothes rushed upon the field and arrested Elberfeld. The crowd poured over the fences, but no blows were struck. Connolly disappeared unnoticed in the general excitement.